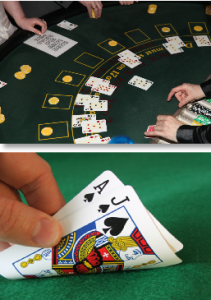 Ace Fun Casino are fully trained croupiers bringing the fun of authentic casino tables direct to you all across the South. You’ll get all the excitement of playing in a real Casino with none of the risks. All our staff are professionally trained, smart and friendly and our casino tables are full-size authentic casino stock so you’ll get that full Vegas experience. Our fun casino hire provides an exciting form of entertainment presented at your venue. We provide the `Fun Money` for you and your guests to buy chips with and the guest with the most winnings at the end of the night will receive a gift provided by yourself. `Fun Money` for a nominal fee. Whether it’s a private hire or a corporate event Ace Fun Casino are here to help! We have attended events all across London, Sussex, Kent and the South East of England. We don’t offer gimmicks that bump the price up! The only expense we haven’t spared on is the service we offer.